Lead Poisoned Eagle — Raptor Education Group, Inc.
We admitted a lead poisoned adult female Bald Eagle this evening from Tomahawk, WI. She was found by group of hunters while they were in the woods. They called REGI to get her help and waited with her while our rescue/transporters Kevin and Linda Grenzer arrived and transported her to Raptor Education Group, Inc.in Antigo. 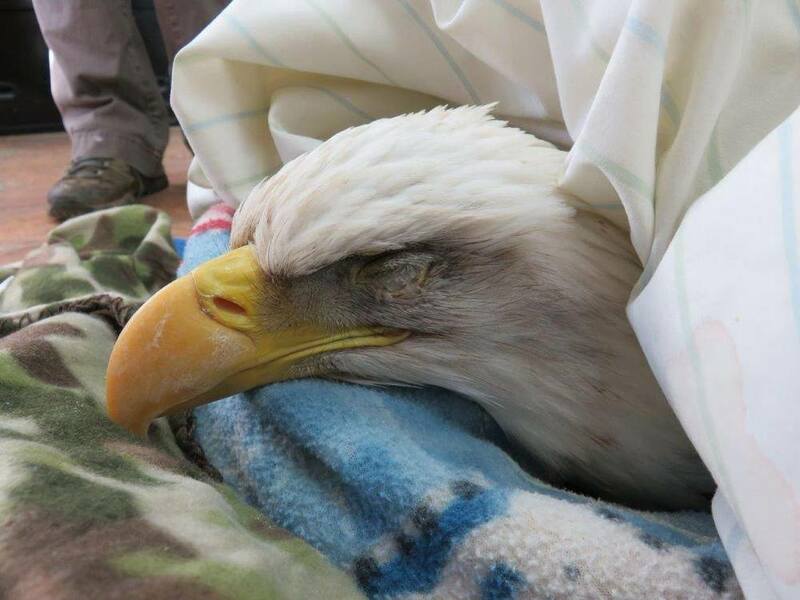 The eagle has a high lead level, is in liver and kidney failure and respiratory distress. She arrived with a very low body temperature. We started treatments soon after she was admitted including CA EDTA injection to begin chelating the lead from her blood, antibiotics to address her respiratory/pneumonia and a heated enclosure to bring her body temperature up to a survivable level. She is in very critical condition, but we are trying our best will stay with her thru the night to assist her. Owl-O-Ween Great horned owl Release!